It’s not often that we write a more personal post about the inner workings of Risen Motherhood, lifting the curtain so-to-speak, but today I want to share with you a (somewhat scary, yet exciting) new endeavor Risen Motherhood is taking on, and ask you to be a part of it. But first and foremost, it feels most appropriate to begin with a thank you. 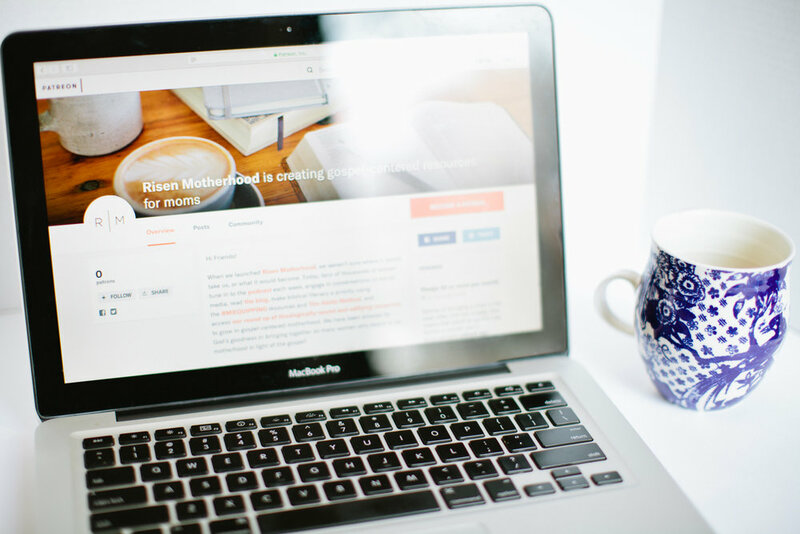 In our opinion, the community of Risen Motherhood is like nothing else on the internet. It’s unique, special, one-of-a-kind, and filled with some of the most amazing mothers around. (And some fathers, grandparents, and even women who have not become mothers yet - you impressive go-getters, you!) So thank you for being a part of the RM community. Thank you for every kind note, every social media share, every time you’ve told your friends about us at a playdate. We are humbled and honored to be a part of your lives, and we thank God for you and your shared love of this ministry. When we started RM two years ago, Emily and I thought we were taking on a small side project that would only last a month or two. We were having discussions on Voxer (An app that’s essentially a sophisticated walkie talkie – we live five hours apart.) all about motherhood and the gospel. We were deep in the throws of potty training, asking each other, “Does God care that I did three loads of jeans and underwear today? Does the Bible speak to how I should react to an accident? What does God’s word say about a three-year-old that doesn’t seem to get an essential part of becoming socially acceptable?” We were desperate for hope, for understanding how scripture connects with worst parts of our everyday lives, and we needed each other to remind us of the truth we already knew. As we worked through gospel application in potty training (and many other motherhood-related issues), we realized we were having these same conversations with our friends, our neighbors, and other family members. We found we were not alone, that moms everywhere needed the same reminders as us. So we decided to air our conversations through a podcast. We thought we’d just release five episodes on some of the major “hot topics” in motherhood, then fade off into the distance. It would be a fun way for us to work together after blogging individually on our own platforms for the previous six years and would give us a chance to try out the up-and-coming medium of podcasts. Little did we know what God had in store. Today, RM has more than 80 episodes in the archives, and tens of thousands of women tune in each week to listen to the latest show. In just two years, we’ve expanded far beyond a podcast, developing several arms for reaching moms with the truth of the gospel, including a blog, social media platforms, Bible study tools, and resource pages – all free to access for anyone in the world. And we even just launched a newsletter! Our blog showcases writing from a diverse group of women, covering topics in motherhood that range from discipline to adoption, sleep-deprivation to doxology, and marriage to Old Testament history. Supported by our social media platforms with microblogs, inspiring quotes, and more, mothers can easily access encouraging content with gospel-truth nearly every day. And we know how difficult it can be to vet a new resource, discover a Bible study tool that’s actually helpful, or find solid toddler books for your children, so we’ve rounded up our favorite books, journals, music, and more, all to help women easily find new tools to flourish in gospel-centered motherhood. But perhaps most importantly, our desire at RM is to see all moms grow in their first-hand knowledge of God. As our heart’s loves often follow the affections of our mind, it’s vital that mothers invest time into the study of scripture. 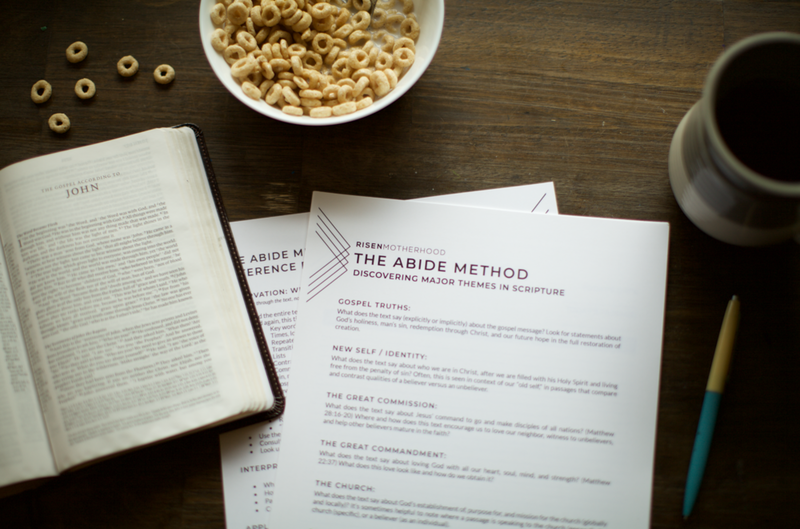 Which is why we’ve created RM|EQUIPPING and The Abide Method – all free Bible study tools for moms (or anyone!) to download and use to dig deep into God’s word for themselves. At RM, we never want to seem like we have all the answers – only the Bible can offer a perfect answer, which is why our hope is to see moms grow in their own understanding of scripture, developing wisdom, discernment, and a gospel-lens to view the world through. But as RM has grown, so have the expenses associated with the ministry. We now pay fees each month for podcast, website and domain hosting, email subscription services, and to develop creative content for the blog, podcast, social media, RM|EQUIPPING, and The Abide Method, through branding, marketing, photography, podcast equipment, and more. We also have a team of five mothers working on the ministry, four of which have never taken a paycheck. We all juggle this ministry in between diaper changes, spreading peanut butter for lunchtime sandwiches, and at the end of a long day when the kiddos are in bed (hopefully). Some of us spend upwards of 30 hours a week on the project, all of us putting in tangible sacrifices to keep the engine of RM running. We are real moms, just like you, with a passion for spreading the good news of Christ’s defeat of death and his coming kingdom, yet we also want to love and prioritize our families well – which means we’d like to find ways to compensate our team fairly for their time. So today, we are launching Patreon, a membership platform for artist and ministries (such as RM) for people to join an intimate community to monetarily support brands they love. And we’d like to invite you to join us. No matter what, our current content at RM will always remain free – we want all mothers to have access to the existing resources and grow together in gospel-training – but if you’re able, will you consider pledging a contribution each month of $2, $5, $10, or $30? At each level, you’ll gain access to rewards that are not available to the public, and your backing will allow us to continue to create high-quality content for mothers around the world, as well as to dream big for the ministry to realize many new projects that won’t be able to come to fruition without it. It’s our belief here at RM, that when you influence a mother, you influence an entire family. You connect her to a gospel-centered audio resource, and you might get her husband to listen to the same one – then engage in a good discussion around that topic in the car on the way to soccer practice. You get her to purchase a children’s Bible, and her children might start hearing scripture at breakfast or before bedtime. You get a mom to think more deeply about the gospel, and in turn, that transformation and example can encourage her husband’s faith, and children look up to it. It is significant work we’re striving for at RM. Our mission goes far beyond simply talking about the ins and outs and practical tips of motherhood, but instead we strive to communicate messages that penetrate the heart, transforming not just actions, but altering motivations, affections and desires. Behavior modification isn't the goal. We never want you to just do something that we do (Which is why we're so staunchly light on the practical, even though we know it annoys some of you! ;)) but instead our hope is to show you that because of Christ's death and resurrection, there is freedom in being the unique mother you were created to be with your individual skills, giftings, and family makeup. At RM, we are passionate about equipping mothers with the gospel to care for and love their families well. We believe that turning a mom’s eyes to cross and the reality of the gospel can incite an entire family to do the same. And we’d love for you to join us in something that is so much bigger than just a podcast, blog, or social media platform. It’s something that will make an impact for eternity. So, if you have been encouraged by RM at any time over the past two years, and if you value and appreciate the work RM is engaged in, will you consider becoming a patron? Please only give as you prayerfully feel led, but even one dollar a month will make a difference for the ministry of RM. No matter what you decide, let me end this as I began: Thank you. Whether you donate or not, every member of the RM community matters to us, and we continue to be humbled and amazed by the ways God is using the ministry to impact women’s lives around the world. It is all him, friends, and we trust him to provide all we need. We are incredibly excited about the future of this ministry and are grateful for all of you who are with us as we learn, change, and grow. So from the bottom of our hearts, thank you. Ps. Wondering about why we’re not just choosing to run ads like other podcasts? We answer this on the Patreon feed. Laura Wifler is the Co-Founder of Risen Motherhood and the Co-Host of the weekly podcast. She's a wife and mom to three littles. Laura likes her coffee black, going on hikes, reading books with real pages to turn, and having impromptu dance parties in the kitchen with her children. The Lie of "I'll do it tomorrow."